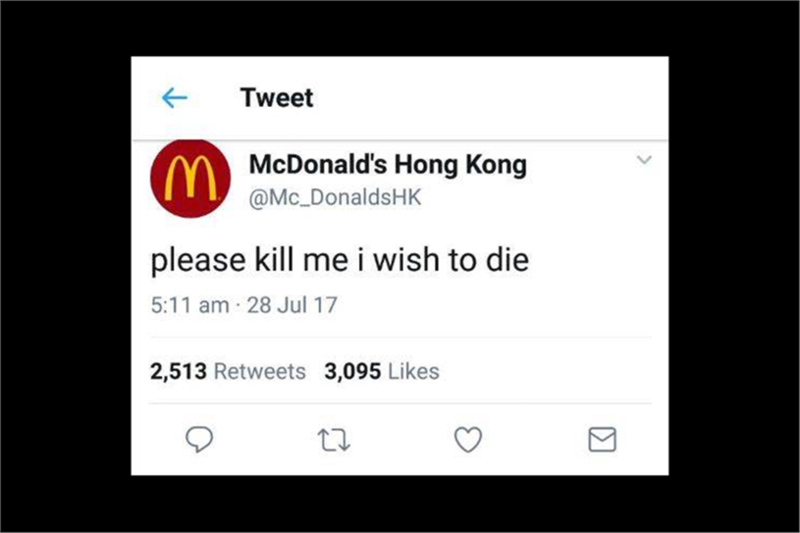 McDonald's Hong Kong received worldwide publicity due to a Twitter squatter making cryptic posts about suicide, kidnap and romantic rejection. An unverified Twitter account with the handle @Mc_DonaldsHK, apparently created in October 2016 and since suspended, has been posting nondescript promotional tweets for products like McSpicy Chicken Filet, the Grand Mac and the Mac Jr (incidentally, both of these have not been introduced in Hong Kong yet). But it went out of character this past weekend. "Please kill me i wish to die" appeared in the midst of legitimate-sounding promotions such as for a tie-in with the Minions movie. "Where is my son they took my son" and "I want to quit. She left me" followed shortly. "I would like my weekends if she just called me back for once. All I do is wait. ", and then "I miss her so f***ing much. F*** this job. Where is my wife and where is my son." These cryptic lamentations about a possibly broken home had users worldwide befuddled. Some were genuinely concerned about the tweeter's mental state of health and offering suicide prevention helplines, some speculating that it was a PR stunt by the brand's social media staffer, and some wondering if the account was hacked. Others made digs about the fast food giant and joked about rivals kidnapping the tweeter's 'son'. The brand's US spokeswoman Terri Hickey told Gizmodo that "this is not a McDonald’s Twitter account but one that is impersonating a verified account, and the company is "taking steps to have it promptly taken down". The actual McDonald's Hong Kong team had the same response as Hickey to Campaign Asia's queries this morning. As for McDonald's Hong Kong itself, the local branch does not seem to have an official Twitter account. The account's handle (@Mc_DonaldsHK) has since been changed to @notMcDonaldsHK, this time specifying it is a parody account, but Twitter did not find it amusing.